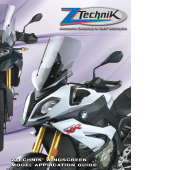 All ZTechnik products are available through ZTechnik authorized BMW® Motorcycle Dealerships and aftermarket parts suppliers around the world, or directly from this web site. Click any of the images below for descriptive views of our various product lines. These pages also have detailed application charts for all current and past BMW model motorcycles. You can also select "BMW" in the PRODUCT OVERVIEW menu above. ZTechnik® is a brand created by National Cycle, Inc. that specializes in high quality motorcycle accessories designed exclusively for BMW Motorcycles. The name itself is from the German "Zubehör Technik," which translates to "technical accessories" in English. The ZTechnik philosophy is to closely follow design principles established by the original equipment designers, produce only the highest quality parts possible, and enhance the rider's total experience. ZTechnik Customer Service Representatives are always ready to help with any questions you may have regarding any of our fine products. ZTechnik Telephone Customer Service is available to you from 8:00AM to 5:00PM (CST) Monday through Friday by calling 866-ZTECHNK (1-866-983-2465). If you cannot reach us during normal business hours, please be sure to e-mail us. For ZTechnik customers outside the United States, and those in Alaska and Hawaii, please call 708-343-0400. ZTechnik – Purebred, high quality accessories... exclusively for BMW Motorcycles. 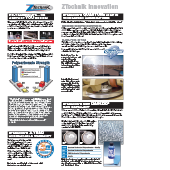 ZTechnik's innovative developments in polycarbonate and Quantum™ hardcoating. An informative chart of all ZTechnik windscreens for BMW® motorcycles with sizes, materials and specifications.